What is dislocation of the shoulder? What causes a shoulder dislocation? What are risk factors for a dislocated shoulder? What types of doctors treat a dislocated shoulder? What are the symptoms and signs of a dislocated shoulder? How do physicians diagnose dislocated shoulders? What are home remedies for a dislocated shoulder? What is the treatment for a dislocated shoulder? What happens after reduction of a shoulder dislocation? What is appropriate follow-up following a shoulder dislocation? How long is the recovery time for a dislocated shoulder? What are potential complications of a shoulder dislocation? What is the prognosis of a shoulder dislocation? Is it possible to prevent a dislocated shoulder? The shoulder joints are the most commonly dislocated joints in the body. Approximately 25% of shoulder dislocations have associated fractures. Closed reduction, without the need for surgery, is the most common initial treatment. Medications may be required for sedation to help relax the muscles surrounding the shoulder and facilitate the reduction. Immobilization with a sling is important to decrease the risk of a repeat dislocation. First dislocations are immobilized in an external rotation position. Recurrent dislocations may be immobilized in a regular sling. Early follow-up is important to decide when to begin allowing shoulder motion. Total time of immobilization varies, and balance needs to exist between shoulder stability and loss of motion and function from prolonged immobilization. Recurrent shoulder dislocations may be an indication for surgery to repair and tighten torn tissues. Uncomplicated rehabilitation and healing will allow return to normal function in 12-16 weeks. The shoulder joint is the most mobile joint in the body and allows the arm to move in many directions. This ability to move makes the joint inherently unstable and also makes the shoulder the most often dislocated joint in the body. In the shoulder joint, the head of the humerus (upper arm bone) sits in the glenoid fossa, an extension of the scapula, or shoulder blade. Because the glenoid fossa (fossa = shallow depression) is so shallow, other structures within and surrounding the shoulder joint are needed to maintain its stability. Within the joint, the labrum (a fibrous ring of cartilage) extends from the glenoid fossa and provides a deeper receptacle for the humeral head. The capsule tissue that surrounds the joint also helps maintain stability. The rotator cuff muscles and the tendons that move the shoulder provide a significant amount of protection and stability for the shoulder joint. Dislocations of the shoulder occur when the head of the humerus is forcibly removed from its socket in the glenoid fossa. 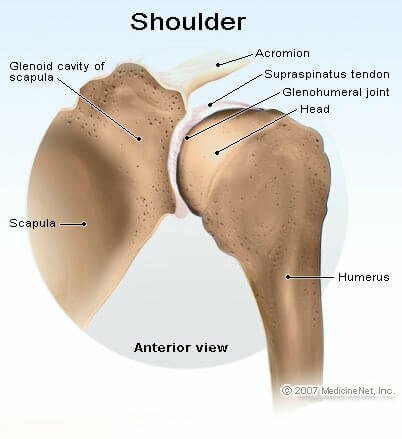 It's possible to dislocate the shoulder in many different directions, and a dislocated shoulder is described by the location where the humeral head ends up after it has been dislocated. Ninety-five percent or more of shoulder dislocations are anterior dislocations, meaning that the humeral head has been moved to a position in front of the joint. Posterior dislocations are those in which the humeral head has moved backward toward the shoulder blade. Other rare types of dislocations include luxatio erecta, an inferior dislocation below the joint, and intrathoracic, in which the humeral head gets stuck between the ribs. Dislocations in younger people tend to arise from trauma and are often associated with sports (football, basketball, and volleyball) or falls. Older patients are prone to dislocations because of gradual weakening of the ligaments and cartilage that supports the shoulder. Even in these cases, however, there still needs to be some force applied to the shoulder joint to make it dislocate. Anterior dislocations often occur when the shoulder is in a vulnerable position. A common example is when the arm is held over the head with the elbow bent, and a force is applied that pushes the elbow backward and levers the humeral head out of the glenoid fossa. This scenario can occur with throwing a ball or hitting a volleyball. Anterior dislocations also occur during falls on an outstretched hand. An anterior dislocation involves external rotation of the shoulder; that is, the shoulder rotates away from the body. Posterior dislocations are uncommon and are often associated with specific injuries like lightning strikes, electrical injuries, and seizures. On occasion, this type of dislocation can occur with minimal injury in the elderly, and because X-rays may not easily show a posterior dislocation, the diagnosis is often missed should the patient present for evaluation of shoulder pain and/or decreased range of motion of the shoulder joint. A shoulder separation is a totally different injury and does not involve the gleno-humeral shoulder joint. Instead, the acromio-clavicular joint is involved. This is where the clavicle (collarbone) and acromion (part of the shoulder blade) come together in the front of the shoulder. A direct blow laterally, often from falling directly onto the outside part of the shoulder, damages the joint, the cartilage inside, and the numerous ligaments that maintain stability. While there may be pain and swelling at the end of the collarbone, the patient usually is able to somewhat move the shoulder itself. The shoulder is the most mobile and least stable joint in the body. Its ability to move in many directions makes it prone to dislocation, and in younger people, sports injuries are a common reason. Throwing or reaching for a ball puts the shoulder at risk because there is little that stabilizes the shoulder joint. Most frequently, the shoulder dislocates in younger adults due to a sporting injury. The second most common age group affected is the elderly patient who falls. As the body ages, the collagen fibers that are the building blocks of tendons, cartilage, and the labrum begin to break down and lose the tight-knit appearance that provides strength to the structures. With age, a reduced amount of trauma (usually a fall on an outstretched hand) is required to dislocate the shoulder. Patients with shoulder dislocations are often treated in an emergency department. Emergency specialists are trained to diagnose a shoulder dislocation and to reduce the joint. They are also trained in different methods of sedation. Orthopedic doctors often provide follow-up care for patients with shoulder dislocations. They are the providers who would also decide whether surgery is required, either for the acute injury or after follow-up to stabilize the shoulder and prevent further dislocations. Primary care providers, sports-medicine physicians, certified athletic trainers, and physical therapists all may have a role in caring for the patient during their initial treatment and recovery. Dislocations hurt. When the humerus is forcibly pulled out of the socket, cartilage, muscle, and other tissues are stretched and torn. Shoulder dislocations present with significant pain, and the patient will often refuse to move the arm in any direction. The muscles that surround the shoulder joint tend to go into spasm, making any movements very painful. Usually, with anterior dislocations, the arm is held slightly away from the body, and the patient tries to relieve the pain by supporting the weight of the injured arm with the other hand. Often, the shoulder appears squared off since the humeral head has been moved out its normal place in the glenoid fossa. Sometimes, it may be seen or felt as a bulge in front of the shoulder joint. As with other bony injuries, the pain may provoke systemic symptoms of nausea and vomiting, sweating, lightheadedness, and weakness. These occur because of the stimulation of the vagus nerve, which blocks the adrenaline response in the body. Occasionally, this may cause the patient to faint or pass out (vasovagal syncope). When a patient presents with a shoulder dislocation, pain control and joint relocation are primary considerations. However, it is still important for the health care professional to take a careful history to understand the mechanism of injury and the circumstances surrounding it. It will also be important to know if this is the first shoulder dislocation or whether the joint has been previously injured. In addition, questions may be asked about medications, allergies, time of the last meal, and past medical history to prepare for a potential anesthetic administration to help relocate, or reduce, the shoulder dislocation. Physical examination of the shoulder will begin with inspection. In an anterior dislocation, the shoulder appears to look "squared off," with a loss of the normal rounded appearance of the shoulder caused by the deltoid muscle. In thinner patients, the humeral head may be palpated or felt in front of the joint. Posterior dislocations may be difficult to assess just by looking at the shoulder joint. Pain and muscle spasm accompany dislocated joints, and a shoulder dislocation is no different. When the joint is disrupted, the muscles surrounding it are stretched and go into spasm. The patient will experience significant pain and will often resist the smallest movement of any part of the arm. The health care professional may feel for pulses in the wrist and elbow, as well as test for sensation to assess the blood and nerve supply to the arm. One place where sensation is tested is the lateral or outside part of the shoulder, also called the deltoid badge area. Numbness may signal damage to the arteries and nerves when the shoulder is dislocated. The brachial plexus, the axillary artery, and axillary nerve are located in the armpit and are relatively unprotected. Plain X-rays may be taken to confirm the diagnosis of shoulder dislocation and to make certain there are no broken bones associated with the dislocation. Two common fractures are the Hill-Sachs deformity, a compression fracture of the humeral head, and a Bankart lesion, a chip fracture of the glenoid fossa. While these may be present, they do not hinder the relocation of the shoulder. Other fractures of the humerus and scapula may make shoulder reduction more difficult. Since the body is 3-D and X-rays are 2-D, at least two X-rays are taken to be able to accurately assess where the humeral head is located -- anteriorly (in front) or posteriorly (behind) in relationship to the glenoid. Extra X-ray views also better assess the bones, looking for fracture. In certain circumstances, (often on the athletic field) if a health care professional is present at the time of injury, an attempt may be made to reduce or relocate the shoulder immediately without X-rays being taken. Using manipulation described below, before the muscles have a chance to go into spasm, it is possible to relocate the shoulder. Imaging of the injured shoulder (X-ray or MRI) would then be considered at a later time. When a shoulder injury occurs and there is concern about a fracture or dislocation, the patient likely needs to seek medical attention urgently. not allowing the patient to have anything to eat or drink, in case sedation is required to reduce the shoulder. Vomiting may occur as a side effect of some of the medications used for sedation, and it is best to have an empty stomach to prevent complications. It is also important to make certain that no other injury has occurred. If needed, it may be appropriate to call 911 and activate emergency medical services. Some patients who have had previous shoulder dislocations and have unstable joints may be able to reduce (relocate) their shoulder spontaneously when they feel it pop out of the joint. The purpose of the initial treatment of a dislocated shoulder is to reduce the dislocation and return the humeral head to its normal place in the glenoid fossa. There are a variety of methods that may be used to achieve this goal. The decision as to which one to use depends upon the patient, the situation, and the experience of the clinician performing the reduction. Regardless of the technique used, the hope is to be able to efficiently reduce the dislocation with a minimum of anesthesia required. Most attempts at closed reductions are successful; that is, no incision or cut is made into the joint to assist in returning the bones to their normal position. The term "open reduction" refers to performing surgery to repair the dislocation. Common methods for reduction of a shoulder dislocation are described below. The patient may be sitting up or lying prone. The health care professional attempts to rotate the shoulder blade, dislodging the humeral head, and allowing spontaneous relocation. An assistant may be needed to help stabilize the arm. With the patient lying flat or sitting up, the health care professional flexes the elbow to 90 degrees and gradually rotates the shoulder outward (external rotation). Muscle spasm may be able to be overcome after five to 10 minutes of gentle pushing, allowing the shoulder to spontaneously relocate. The Milch technique adds gentle lifting of the arm above the head to achieve reduction. With the patient lying flat, a sheet is looped around the armpit. While the health care professional pulls down on the arm, an assistant, located at the head of the bed, pulls on the sheet to apply counter traction. As the muscles relax, the humeral head is able to return to its normal position. With the patient lying prone (on their stomach), the injured arm is draped over the side of the cot and a weight is attached to it to gradually overcome muscle spasm and allow the shoulder joint to reduce. Other potential options for relocating a shoulder dislocation include the Milch technique, axillary traction, and the Spaso technique. In rare circumstances, the shoulder cannot be reduced using closed reduction techniques because a tendon, ligament, or piece of broken bone gets caught in the joint, preventing return of the humeral head into the glenoid. When closed reduction fails, it may be necessary for an orthopedic surgeon to perform an operation or open reduction. Depending upon the amount of pain and spasm present, medication may be needed to sedate and comfort the patient prior to and during the reduction procedure. These medications may also be given to relax the muscles to aid in the joint reduction. Patients receiving intravenous medications need to have their vital signs monitored before, during, and after the shoulder relocation just as if they were in the operating room. In some circumstances (for example a patient with underlying lung or heart illnesses), the presence of an anesthesiologist or nurse anesthetist may be appropriate during the relocation. Health care professionals use intravenous sedatives, narcotics, and muscle relaxants in combination for analgesia (to relieve pain), relax muscles, and help promote amnesia of the events. Common procedural medications now include ketamine or propofol. Other medications include narcotics (morphine, hydromorphone, and fentanyl), which may be combined with muscle relaxants (midazolam, diazepam, lorazepam). Some health care professionals may consider using intra-articular (intra = within + articular = joint) injections of lidocaine (Xylocaine) into the shoulder joint as local anesthesia to try to reduce the shoulder, instead of using intravenous sedation. Once the shoulder has been reduced, the health care professional will want to reexamine the arm and make certain that no nerve or artery damage occurred during the reduction procedure. A post reduction X-ray is recommended to reassess the bones and insure that the shoulder is properly relocated. Significant damage occurs to the joint with a shoulder dislocation. The labrum and joint capsule have to tear, and there may be associated injuries to the rotator cuff muscles. These are the structures that lend stability to the shoulder joint, and since they are injured, the shoulder is at great risk to dislocate again. A sling or shoulder immobilizer may be used as a reminder not to use the arm and allow the muscles that surround the joint to relax and not have to support the bones against gravity. For a patient who sustains their first shoulder dislocation, the clinician will often immobilize the shoulder in mild external rotation, meaning that the arm is placed in a special sling that supports the arm away from the body. The physician may place repeated dislocations in a regular sling or immobilizer for comfort and support. The length of time a sling is worn depends upon the individual patient. A balance must be reached between immobilizing the shoulder to prevent recurrent dislocation and losing range of motion if the shoulder has been kept still for too long. Once a clinician reduces a shoulder dislocation, much of the pain abates. Physicians may recommend ibuprofen (Advil, Motrin) or acetaminophen (Tylenol) for pain control and may prescribe a few narcotic pain pills like codeine or hydrocodone for the short term. Ice is an important component of pain control, helping to decrease the swelling associated with the injury. In certain situations, it's possible to reduce dislocations immediately. This is especially true in the sports medicine arena, where a health care professional may reduce the dislocation on the field of play. This is a reasonable treatment alternative because the care provider was able to see the injury occur, examine the patient and come to the diagnosis, and then reduce the injury before muscles spasm sets in. Many patients experience shoulder subluxation or partial dislocation. These are patients who have had previous dislocations and are aware that their shoulder has dislocated again and then spontaneously reduced. They may choose not to seek urgent or emergent care, but this situation should not be ignored. Once a shoulder dislocates, it becomes unstable and more prone to future dislocation and injury. Follow-up with a primary care provider or orthopedic surgeon is advised after a shoulder dislocation. The decision as to when to begin range-of-motion exercises of the shoulder has to be individualized for each patient. In shoulder dislocations not associated with a fracture or other associated injury, younger patients may be kept immobilized for two to three weeks. In the elderly, this time frame may shrink to only a week because the risk of a frozen shoulder (a joint that becomes totally immobile) is markedly increased. It may be necessary to get X-rays or a magnetic resonance imaging (MRI), depending upon the patient and the situation, to evaluate the extent of potential injury to the joint, including the bones, labrum, and cartilage. Some patients may be candidates for surgery to prevent future dislocations. The decision depends upon the extent of damage to the joint and the type of activities in which the patient participates. This decision is individualized for each patient. Physical therapy is an important component to return the shoulder joint to normal function. Therapy may include exercises to strengthen the muscles that surround the shoulder and to maintain range of motion of the shoulder joint. The total rehabilitation and recovery time from a shoulder dislocation is about 12-16 weeks. Fractures of the bones that make up the shoulder joint are a possible complication of shoulder dislocations. Up to 25% of patients will have an associated fracture. Not included in these numbers are the Hill-Sachs deformity that may occur in up to 75% of anterior shoulder dislocations. Nerve damage is a potential complication. Most often, the circumflex axillary nerve is injured. The first sign of injury is numbness in a small patch distribution on the outside of the upper arm. This nerve often recovers spontaneously in a few weeks, but this is an important complication for the health care professional to recognize since damage to the nerve may cause weakness of the deltoid muscle that helps move the shoulder. Older patients who dislocate their shoulder may have rotator cuff injuries. The diagnosis may be difficult to make initially, and often the health care professional will make the diagnosis during a follow-up visit. Rare complications of shoulder dislocations include tearing of the axillary artery, the main artery that supplies blood to the arm and brachial plexus injury, in which the nerve bundle that attaches the arm nerves to the spinal cord is damaged. Both of these structures are located in the axilla or armpit and are potentially damaged by the initial dislocation or by attempts to reduce the dislocation. The goal of shoulder dislocation treatment is to reduce the shoulder and then to strengthen the tissues surrounding the joint to prevent recurrent dislocations. Age is the major factor as to whether there will be another dislocation. The younger the patient, the more likely that another dislocation will occur. If the first dislocation happens before age 20, there may be up to a 95% chance that there will be a second dislocation in the future. With an age younger than 40, the risk of future dislocation is less than 50%. With an age older than 40, this risk drops to 10%. Accidents and injuries happen, and the first dislocated shoulder usually cannot be prevented. The risk of recurrent dislocations may be decreased by following the physical therapy care plan after that first dislocation to strengthen and stabilize the shoulder. This includes wearing the sling for the appropriate amount of time, committing to the rehabilitation program, and keeping the shoulder muscles strong. Cleland, J., S. Koppenhaver, and J. Su. Netter's Clinical Orthopedic Examination: An Evidence Based Approach, 3rd Edition. Philadelphia, Pa.: Elsevier, 2015. Iannotti, J.P., and G.R. Williams. Disorders of the Shoulder: Diagnosis and Management, 2nd Edition. Philadelphia, Pa.: Lippincott Williams & Wilkins, 2007. Kane, P., et al. "Approach to the treatment of primary anterior shoulder dislocation: A review." Phys Sportsmed 43.1 Feb. 2015: 54-64. Rhee, Y.G., N.S. Cho, and S.H. Cho. "Traumatic anterior dislocation of the shoulder: factors affecting the progress of the traumatic anterior dislocation." Clin Orthop Surg 1.4 Dec. 2009: 188-193. Tintinalli, J., et al. Tintinalli's Emergency Medicine: A Comprehensive Study Guide, 8th Edition. New York, N.Y.: McGraw-Hill Education/Medical, 2015. What caused your dislocated shoulder? What were the signs and symptoms associated with your dislocated shoulder? What kinds of exams or tests led to a diagnosis of a dislocated shoulder? What was the treatment or therapy for your dislocated shoulder? What were the complications related to your shoulder dislocation? Multiple drug interactions, dosage, and pregnancy and breastfeeding safety should be reviewed prior to taking this medication. A frozen shoulder (adhesive capsulitis) is when the shoulder joint experiences a significant loss in its range of motion due to inflammation, scarring, or injury. Treatment involves anti-inflammatory medication, cortisone injections, and physical therapy. Hydrocodone (brand name Zohydro ER) and hydromorphone (brand names Dilaudid and others) are opioid narcotics prescribed to patients with moderate to severe pain for which other pain therapies have not provided adequate pain management. Both narcotics have a Black Box Warning from the FDA about serious side effects including coma and death. You are taken the drug in larger doses than your doctor prescribed. You have a persistent desire, and often have unsuccessful attempts to cut down or control the use of the drug. You have a strong desire or craving for the drug. You spend a lot of time doing various things to get or use the drugs. You have problems at work, school, or relationships. You withdraw from social activities because of the drug. NIH; National Institute on Drug Abuse. "The Science of Drug Abuse and Addiction: The Basics." Updated: Oct 2016. Rotator cuff disease is damage to any of the four tendons that stabilize the shoulder joint. Shoulder pain and tenderness are common symptoms. Rotator cuff disease treatment depends on the severity of the shoulder injury.